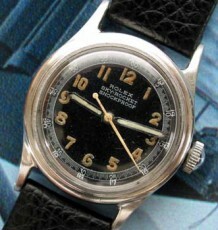 This Rolex Datejust carries the case reference number 16263. It has a solid gold Turn-o-graph rotating bezel. This model is known more commonly as the “Thunderbird.” The 18K yellow gold bi-directional rotating bezel is graduated with a sixty second scale. 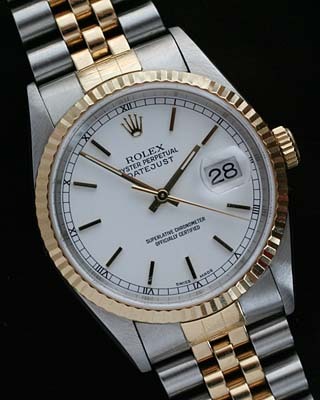 The watch is fitted with a champagne dial with gold baton markers and the quickset date at three. 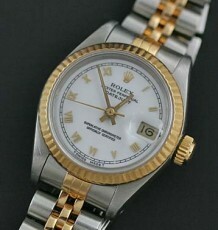 The SS/18K Rolex Jubilee bracelet features a folding clasp and will fit a 7 3/4 inch wrist. The bracelet does show some stretch but it still quite wearable. 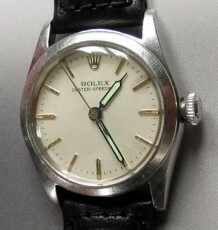 The Rolex calibre 3135 chronometer rated movement is fitted with 31 jewels and as it was just serviced runs like new. 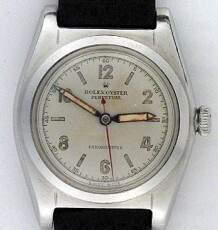 This watch carries an x serial number, dating it to 1991. The case measures 36 mm wide by 44 mm long.